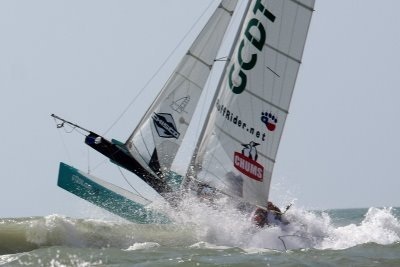 Lee Wicklund on his Nacra 20 going for it in the surf! Given the name of our sailing group “Surfside Sailing” it may come as no surprise that we deal with surf almost every trip out. I am not an expert by any means in fact the sea sent me for a swim just last weekend! The truth is even the best sailors can get into trouble in the surf, sometimes it feels like you were set up or the sea played a trick to show that you are still at her mercy. If you sail in the surf enough one day it will likely catch you off guard till then all you can do now is read these helpful tips. Wind direction is the biggest consideration when sailing through the surf! Offshore breezes Seem great with the wind behind you getting out past the surf is pretty easy not mention it can also flatten out the surf. Make sure you have checked the forecast before you head out in an offshore breeze this could be a storm front and the winds can pick up dramatically in a very short period. The other problem with offshore breeze is its blowing you out to sea so if your boat dismast or breaks you can be blown to Cuba. If you do decide to go out in an offshore breeze stay close to the beach hang just outside the breakers and sail with a group also a handheld VHF radio is recommended. Onshore breezes are very hard to deal with for 2 reasons first onshore breezes tend to generate bigger surf. Second you have to sail thru the surf upwind this means you will be sailing close hauled and even turning into irons sometimes when bigger waves hit you to avoid getting broached. This is challenging and is one of the most difficult scenarios when it comes to sailing out thru the surf and I would discourage you from attempting it if you are not a skilled sailor and very familiar with your boat. Sideshore breezes are ideal for getting out thru the surf you can sheet your jib in tight and blast over waves! The jib will do the work just use your weight to keep the boat balanced and let the jib carry out deep enough to get your rudders down. DO NOT SHEET THE MAIN UNTIL YOU HAVE YOUR RUDDERS DOWN! In the excitement people tend to start sheeting in the main before the rudders are locked down this causes weather helm and can also cause your boat to turn into the wind slowing you down and maybe even causing you to broach. The keys to sailing through surf keep your boat balanced, your speed up and point the bows into the waves as they hit then fall off a bit if needed to gain speed always turn back into the waves before they hit you. It will get easier as you build up speed once your rudders are down sheet the main and enjoy the ride! So now you are an expert right! As I said before things happen you will slip up or your boat will malfunction and the sea will show you who is in charge. What do you do when this happens? Stay calm and get everyone to the boat a.s.a.p. then take a quick assessment of where you are if you are still pretty far out get the boat back up quickly head back in and check for damage. If the boat is close to shore you may not have time to get it righted the best thing to do is grab the mast and keep it pointed away from the beach and float it in with the surf. You can practice this an other skills at our Fleet 33 launch party April 16, 2011 @ the 10 Mile spot in Surfside, Texas hope to see everyone out!! ~ by Floyd on March 15, 2011. Oh like a retirement home for boats! You can send all homeless Supercats back to the ocean where they belong. Lol!